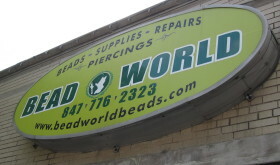 Bead World features a fine selection of traditional and ethnic pieces, old and new, as well a lots of beads, beads, beads! We have Semi precious stones, Swarovski Crystal, freshwater pearls, wood, bone, and other natural material beads, a great selection of glass from the Czech Republic, Vintage German Beads, fiber optic beads, sterling silver beads, findings and clasps in silver, 14K gold filled, copper, base metals and way too much to mention! 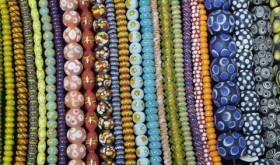 Bead World has a large selection of hand made Indonesian glass beads as well. We also specialize in custom made bead jewelry.